Gutta or resist, and applicator bottle with tip. This is like a glue that you use to draw a picture on your stretched silk. When it dries, it will contain the paint in those areas. After your design is painted, dried, and heatset with an iron, the resist simply washes out. Or choose a colored gutta/resist that is also heat-set, to get colored outlines. 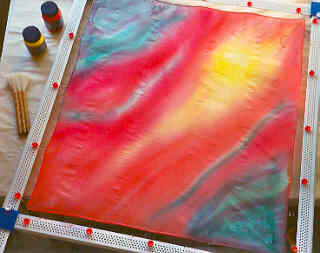 To paint a silk scarf, it is first pinned and stretched out on a frame like a trampoline. For a watercolor effect (below), it is then painted with water first, and colors are added quickly so they blend together. Sea salt or drops of rubbing alcohol may be applied to push the dye away from small areas, leaving a scattering of light colored or white specks. 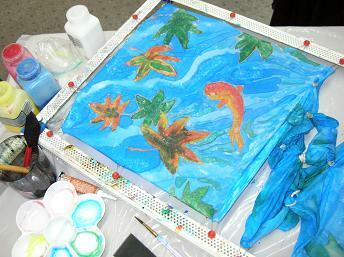 ADVANCED: Koi Pond (below)- Stretch the silk, then use gutta to outline the fish shapes and leaf shapes. Let the gutta dry for at least 20 minutes. Then select your colors and let them blend inside the shapes - don't paint too close to the lines! The color will spread out on its own to fill in the shapes. Paint the background in wavy lines, so that the hard edges that come from painting on dry silk look like water ripples (see the same effect in tan and red - photo right). Throw on some salt for effect if you like. Let dry for 24 hours, iron to heat set, let sit another 24 hours, then wash, line dry, iron and wear! 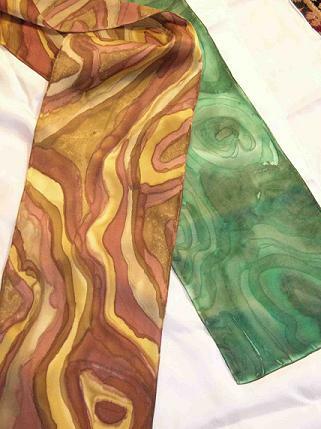 For a stained glass look, gutta resist (a glue-like substance) can be applied on dry silk. A squeeze bottle and metal tip allow the gutta to be applied in thin lines, ideal for drawing butterflies, flowers, birds and animals, or geometric shapes. After the gutta dries, silk paint or dye will not escape the lines (see photo above). Silk paint is heat-set by ironing, while silk dyes must be steamed. Gutta can be washed or dry cleaned out so the fabric is not stiff where it was applied. Without gutta (see below) you can still get hard lines by painting quickly on dry silk. The color will spread like grape juice on a tablecloth, so don't paint the lines too close together - they will spread together on their own. While silk-dyed items may be dry cleaned, silk-painted items MUST be handwashed in cold water only. Dry cleaning silk-painted items may remove the color!